Princess Peach's room is a room in Princess Peach's Castle that belongs to Princess Peach. Mario finding Toadstool's ??? in her room. 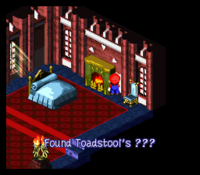 In Super Mario RPG: Legend of the Seven Stars, Peach's room (referred to as Toadstool's Room) is staffed by Grandma. It features a couple of candelabras at the entrance, a blue bed, a lit fireplace, and a blue chair besides the fireplace. If Mario enters the room when he first arrives at the castle, he can pick up Toadstool's ??? between the fireplace and the chair. Grandma immediately takes the item away from him, but gives Mario a Mushroom in return. When the castle is attacked by Shysters, Toadstool's Room becomes a shelter for some of the Toads. A Save Block also appears in the room, and Grandma can fully heal Mario and Mallow if she is talked to (though she prevents them from sleeping in the bed). 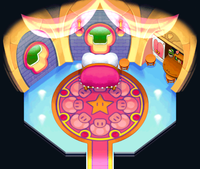 Princess Peach's room reappears in Paper Mario, containing many more personal amenities, including several paintings, a row of pink dresses, a pink bed with a curtain, and a balcony. During the party, a Toad guards her room, preventing anybody from entering it. However if Mario keeps asking to enter, he eventually gives up and allows Mario inside. When the castle is taken over by Bowser, Princess Peach is kept captive in her room, and the door is constantly guarded. The room has a secret passage through the fireplace, which is accessed by flipping a switch hidden by a nearby painting. The passage connects directly to a room that Bowser is using for himself. Throughout the events of the game, Peach uses the passage to sneak out of the room and explore the castle. If she is ever caught by a Koopatrol, she is immediately brought back to her room. Peach's room later appears in Mario & Luigi: Partners in Time. Princess Shroob, disguised as Princess Peach, was brought to the room when Mario and Luigi found her with a Shroob Mushroom covering her face. Bowser, also believing her to be Peach, kidnaps her before falling into a Time Hole that leads to Thwomp Volcano. Afterwards, Baby Peach stays in the room, under Toadsworth and Toadsworth the Younger's vision. This page was last edited on April 1, 2018, at 19:47.